We’ve all heard of athletes collapsing (and sometimes dying) during a game or practice. It’s not often that a player’s final moment comes after his greatest career moment, though. Add in the fact that the player in question isn’t even old enough to vote, and the level of tragedy surpasses its statistical improbability. A high school basketball player has collapsed and died after scoring the winning layup in overtime to give his team a perfect season. Wes Leonard, 16, a junior at Fennville High School in Fennville, MI, was pronounced dead on Thursday night. Cause of death has yet to be determined. Leonard, who also played QB for the Fennville High football team, was playing his last basketball game of the season. Paramedics performed CPR on Leonard and he was taken to Holland Hospital, where he was pronounced dead. 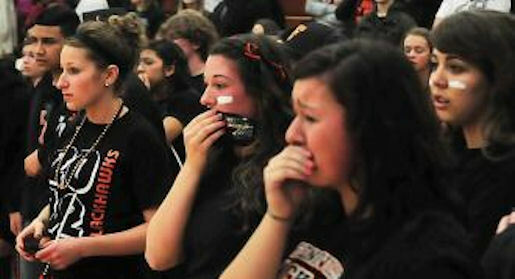 Grief counselors were on hand at Fennville High on Friday to help classmates process the news. You often hear the phrase “giving his/her all” when it comes to a player’s performance in a big game, but you don’t expect it to happen so literally, or in such fashion. I’m sure Fennville High would rather be dealing with a 19-1 season than this kind of loss. Our thoughts and prayers go out to Wes Leonard’s family, friends and hometown.